When ESPN announced that CFO Christine Driessen was interviewed by Pink Magazine about her career, they did not mention other things that were said in the article. Those would be a continuation of budget cuts, staff cuts, project cancellations, etc. But make no mistake about it, ESPN is a rare commodity in the Disney empire. It is profitable, and that only happens when leadership is strong and committed. Unfortunately, whenever cuts are made, the worker bees feel the brunt of the decisions, and this applies to any industry. Driessen, who is one of a number of leading sports media professionals to come out of Fordham University, recently ranked number 78 in Business Week's October 2008 Power 100 in sports rankings. 2009 is coming to an end – and hopefully, so is the recession. So what is it going to take to start 2010 on a stronger note? 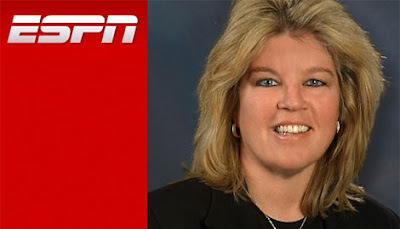 ESPN Executive Vice President and CFO Christine Driessen says the biggest leadership challenge in the New Year will be the same as in 2009 – rescaling and resizing. "Even when we're out of the recession, the revenues and investments won't be the same as even two years ago, and we have to be realistic about that. So everyone has to be leaner and stronger." And that means leaders must have the courage to make difficult decisions, she says. "We're looking at all our lines of business and determining if there are certain things we can no longer invest in and where we can cut more costs that won't impact what the fans see – whether that's how our people travel, the number of cameras on a set or how we produce football games versus basketball games." It also means giving up on some "bubble projects," she says. "When there is a downturn, we no longer have the luxury of waiting a few years to see if every project we think has potential but isn't making money now will perform." Tough times mean focusing on the core business drivers, she explains, and sometimes that means cutting the cord. "That's an incredibly difficult thing to do. People have invested time and energy, and shutting down a facet of the business typically entails downsizing and refocusing strategies," she explains. "At the same time, we'll continue to be aggressive in investing in things we really do believe will bring long-term growth, like our recent acquisition of Premier League rights in the U.K. The full interview is on the Pink Magazine web site.